Michigan has added a running back via the rare transfer scenario. Ex-USC Trojan Ty Isaac took to twitter on Thursday to announce that he will be joining the Wolverines for the 2014 season. On NSD 2013, Isaac chose the USC Trojans over the Michigan Wolverines. Fast forward two years and, Isaac has landed on the Wolverines roster in an inconspicuous way. Isaac becomes the first player to transfer to Michigan since 2007, when QB Steven Threet came to Ann Arbor. News broke late Wednesday night that Isaac had possibly told the coaching staff that he will be joining the Wolverines. Isaac had been on campus for two days when rumblings of a commitment began to surface. Ty is transferring closer to his home in Illinois, to be closer to his mother who is having complications from a recent surgery. According to NCAA waiver rules, if Isaac was to transfer to a school within 100 miles of his hometown of Joliet, he would be eligible to play immediately. Unfortunately, Ann Arbor is about 250 miles from Joliet, so Ty may be forced to sit out the 2014 season. Isaac is expected to make his case in front of NCAA bigwigs to allow him to play this season. Being 6'3, Isaac has exceptional size to play a "north-south" running game. Even though you don't often see running backs his size, Ty has big play ability. He has great speed and the ability to make any defender miss. Ty can play inside or outside the tackles and, does a good job of lowering his head and absorbing contact. Ty features a nasty stiff-arm, that allows him to gain extra yards while fighting off defenders. One of the more underrated qualities Ty possesses is his ability to catch the ball. Ty does a good job of getting out of the backfield and catching the ball in front of him with both hands and, cradling it into his body. Once he has the ball, his eyes are focused down field, looking for his next block to get him into the end zone. Isaac spoke with Rivals EdgyTim about why he wanted to transfer to Michigan. "I just always felt that Michigan was one of the schools I wanted to look into once all of this started happening. They have all of the same coaches except one since I was recruited by them. They have a great staff, a great tradition and I also feel like I will be a good fit. The offense is a good system for me and I feel that I can come in and compete right away." In high school, Ty was an Under All American setting rushing records at his Joliet Catholic High School, rushing for 2,629 yards. 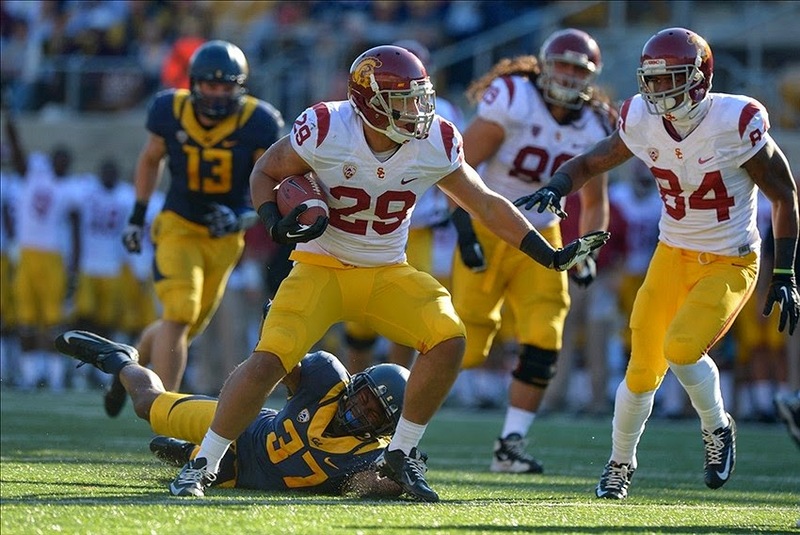 As a freshmen at USC, Ty rushed for 236 yards on 40 carries and 2 touchdowns. This is a huge addition to the Michigan roster. If Ty is able to play right away in the 2014 season, Michigan could feature one of the more dominant backfields in the nation. Isaac joins fellow 2013 recruits Derrick Green and De'Veon Smith in a very young, talented running back corps. A two-headed monster of Green/Isaac would strike fear into any defense. If Isaac is unable to play this season, it may work out more in Michigan's favor. Michigan didn't take a running back in the 2014 cycle, and having Ty red-shirt, would give him an extra year of eligibility over the other 2013 running backs. With Michigan seemingly falling out of favor with 2015 running back's Damien Harris and Mike Weber, this elevates any pressure to grab a big time recruit in 2015.